This session was one big happy accident. 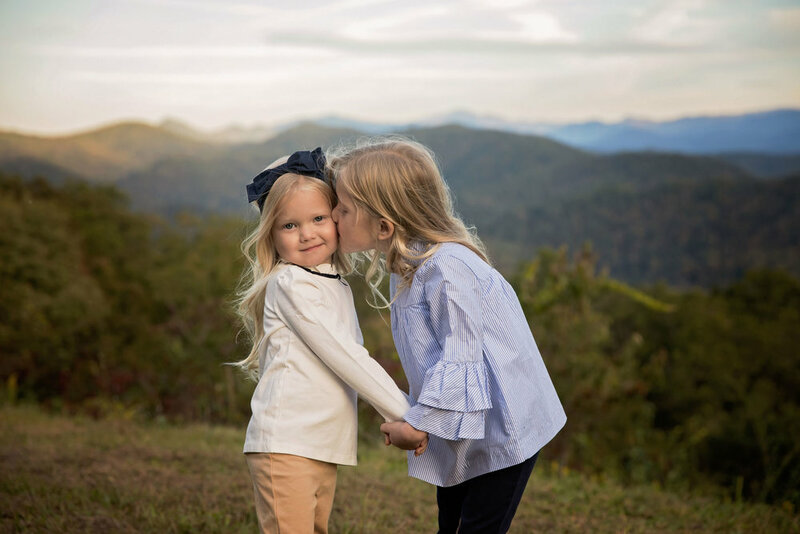 Claire’s sweet extended family booked we well in advance, we had planned out where to go for a great Smoky Mountain backdrop in their Gatlinburg vacation photos. We drive in, all excited, and guess what?? Road closed for excessive bear activity. LUCKILY, we found another great spot, and there was a smidge of hazy fog, which made the lighting just magical. Apparently it was just meant to be for them to have these stunning portraits. I can’t even tell you how much I love, love, love these! During extended family sessions, I love to do a great mix of the whole gang, separate families, grandkids all together, and so many more. These a definitely moments you want to remember and capture while everyone is together. Oh this session makes my heart happy <3. Jessica and her little family are just lovely, and we share an obsession with the beauty that is Cades Cove. They were visiting Gatlinburg TN before the arrival of their new addition. Of COURSE we had to do a session in Cades Cove because their sweet baby boy will be named Cade after one of their very favorite places in the world. 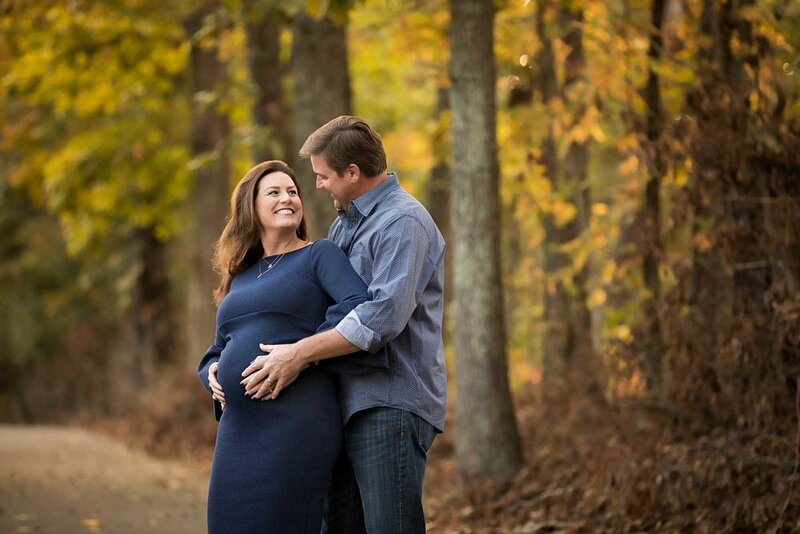 While a bit chilly, the weather and light was perfection for their family and maternity session. So perfect, I had a hard time not photographing them for hours, let alone narrowing down my favorites for this blog! Keep scrolling, you’ll see why! The best part?? Jessica wore one of my client closet maternity gowns, and when she came out of the changing tent I told her sweet son to look at how pretty mom looked, and asked him to go stand next to her for a picture. His answer through tears?? “I can’t stand next to her, she’s just too pretty”. Cue the “awwwwwww” moment. Oh. My. Gosh!!! 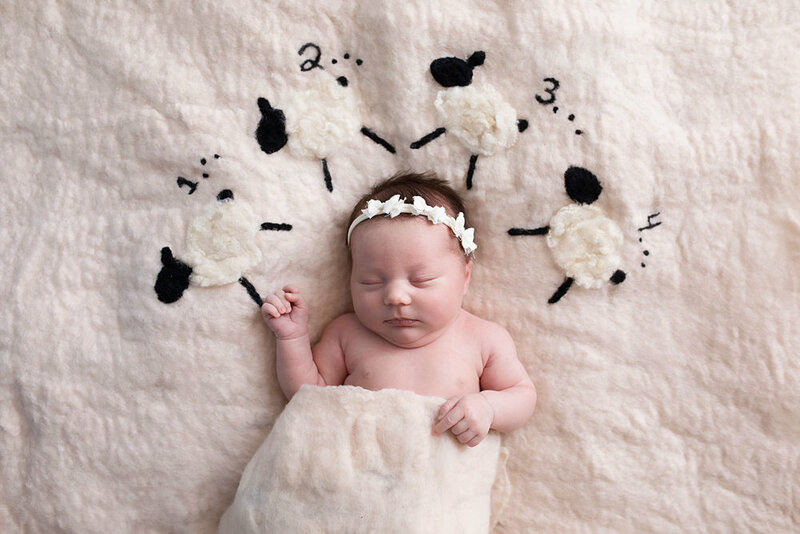 Check out this sweet Knoxville newborn session! 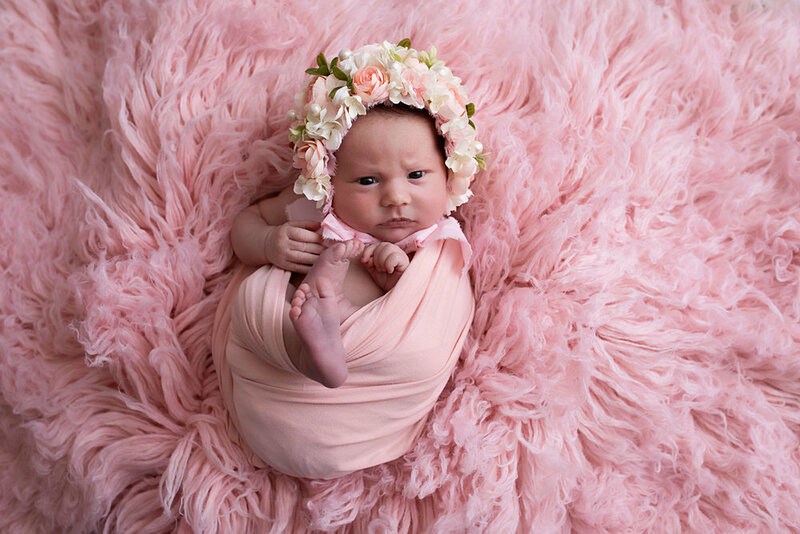 This beautiful, beautiful little girl was born on none-other than Valentine’s Day! I was so excited to put together her sets and include fun pinks and reds to symbolize such a fun birthday! This is a bit off topic, but I just wanted to take a minute to tell you that I’ve found a fabulous moving company for anyone coming or going from the Maryville or Knoxville TN areas ( they also do long distance). Their prices cannot be beat!!! I’ve used them personally, and to move my studio when needed, and it’s always been great. I love when I can support local, and it’s an amazing experience! I know some Gatlinburg photographers cringe when they get a request for a family reunion portrait sessions in the mountains, but I’m an oddball! I LOVE these big family pictures and getting to meet so many great people. Don’t get me wrong, sometimes getting thirty people into place is a bit like herding cats and I have to get a bit bossy, but WOW are the results worth it! I’m from a pretty small family myself, so I truly love being immersed in the fun and love of these big groups. Let me tell you, we laugh and joke, a LOT. It’s truly as great a time for me as them. The Delorey family had 29 members join them for their Pigeon Forge vacation, which is on the larger side of groups I’ve photographed. The heads of the family had five handsome sons, who all started their own beautiful families. These guys were pros at this, and the beautiful sister-in- laws?? So helpful and organized with the session, they were just amazing at helping me get everyone in place for the perfect pose. Thanks ladies!!! Let’s not forget that it rained most of the day, so the fields were a muddy mess, and we had to cross our fingers the skies didn’t open back up, but they were troopers! Don’t take my word for it though, see for yourself! The lovely Ritchey family contacted me a few months before their vacation to Gatlinburg Tn to plan a fabulous family session. As the mother of four boys, she knew a mixture of planning, prepping, and fun was the key to a great family portrait session. Let me tell you, working with four young boys can be a challenge, but nothing I wasn’t up for! I’m not going to lie, there were moments, no one would look at the camera, and they were just over it; and let me tell you, it’s totally normal, and we always end up with amazing images!!! Cades Cove, with is 365 degree mountain views makes the perfect spot for vacationers. You get gorgeous images that are so different than everyone elses. Those mountains are just perfection, not to mention the fields! We ended up having SO MUCH FUN. We took posed images, and laughed, and played games for the perfect candid/posed mixture. They’re just a lovely family and I’m so glad I had the pleasure of meeting them. Any day I get to spend in the mountains is a good day, especially with a big, fun family like Paige's! I come from a small family myself, so I really do love interacting with these bunches full of life and personality. The sun shined, and the lighting was beautiful for their session date, despite the threat of rain all week ( crazy east TN weather!). I couldn't have asked for a prettier day for this beautiful family. Sometimes I get to do funny face pictures; always a hit with the kiddos! What extended family session would be complete without grandparent snuggles? Paige's sweet family of three and me stepped away for a few minutes for some family portraits and they are gorgeous! Don't take my word for it, check them out yourself. Meet Cortland! A STUNNING mom-to-be who wanted a gorgeous Smoky Mountain maternity session while her and her family stayed in a cabin in Gatlinburg TN. She is one outdoorsy godess, so we chose to do her session in Cades Cove ( on a frigid day, not that she shows it!!!). Seriously, it was middle of winter, below freezing, and she toughed out her Gatlinburg photography session like a pro model! I couldn’t have done it. I myself was in a coat! I love the woodland feel that photographing in Cades Cove gives; it just magical. Here’s my faves!!! I’ve had the absolute pleasure of working with this stunning family for several years now. This year’s session was GORGEOUS! By happy accident, we ended up on the Foothills parkway,, down the road from Gatlinburg overlooking the Smoky Mountains with perfect fall weather. Didn’t Amy do a fabulous job with their wardrobe?? Everyone looks flawless! This beautiful family had a small family reunion during their trip to Gatlinburg TN and one of the daughters, Amy, asked me to meet up for some extended family pictures. I couldn't ask for a sweeter family; it was truly a pleasure to spend my evening photographing them and playing with their little ones. 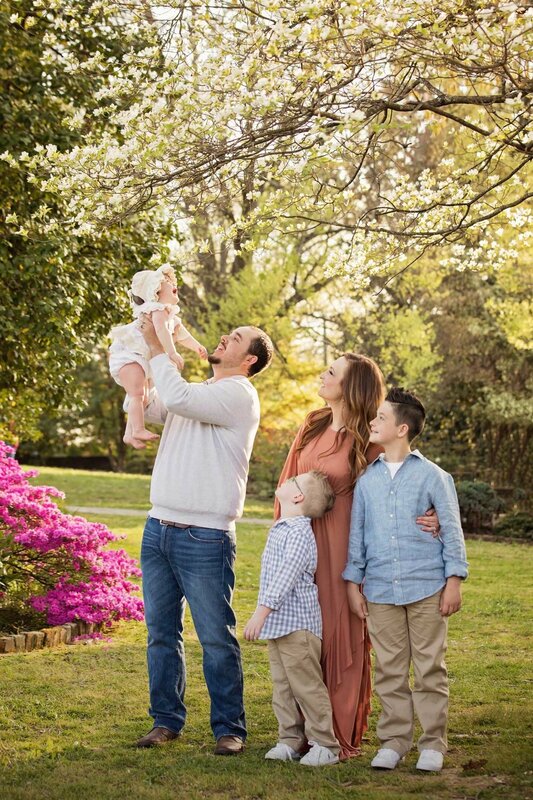 We chose a beautiful park in Knoxville, Sequoyah Hills, for their session to make it convenient for some of their family members to make it down. It's been a super warm year with a fair amount of rain, so the greenery was just beautiful, and the bright colors they chose in their outfits, popped perfectly. Seriously, if you want to know how to do bright colors well for pictures, just look here. Without further ado, here are some of my favorites. The best part? They brought bubbles for the kiddos to play with at the end. So cute!! Bayleigh has such a sweet little family! 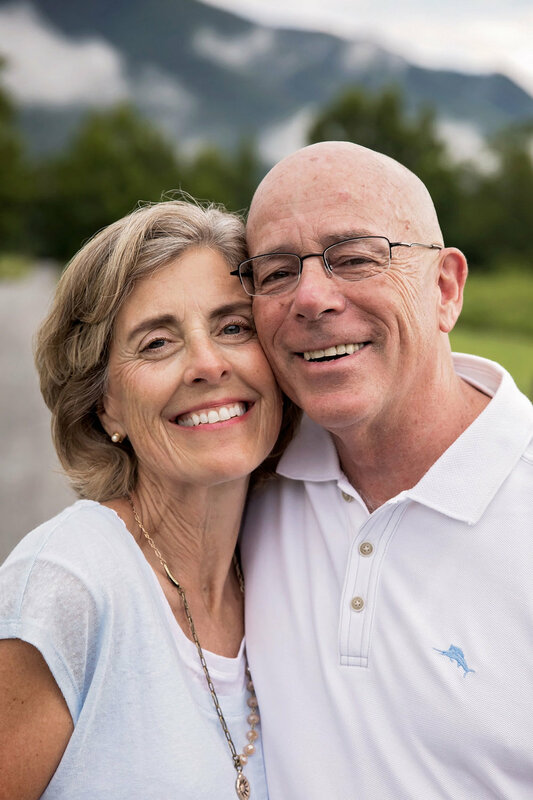 I had the pleasure of meeting in them on their Gatlinburg family vacation; they decided it was the perfect time for updated pictures. 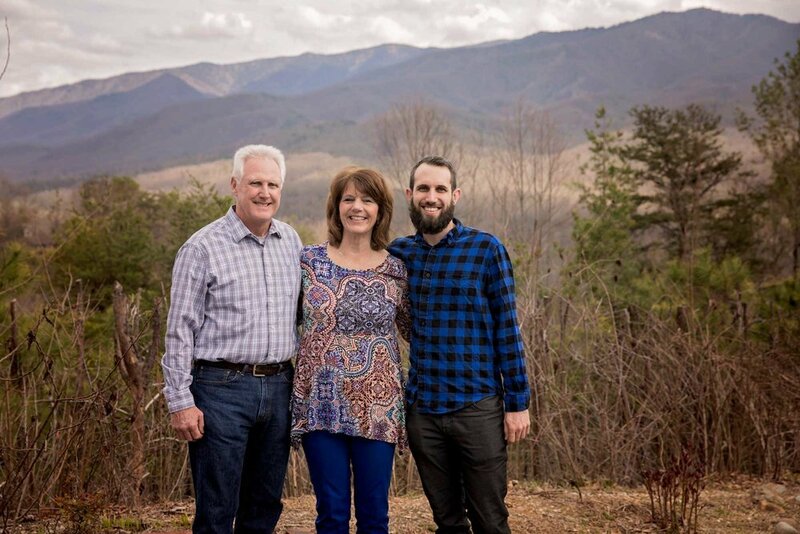 Who wouldn't want beautiful family pictures in the Smoky Mountains? They were just the sweetest couple with their beautiful big-eyed baby boy. He could melt your heart with one look and loved to have his Mom and Dad's attention during some of our fun, playful poses. Little man really loved the kisses and tickling that took place. Getting to spend time in Cades Cove during your vacation for pictures is such fun! We run into wildlife and soak in the natural beauty and really enjoy what the Smokies have to offer. 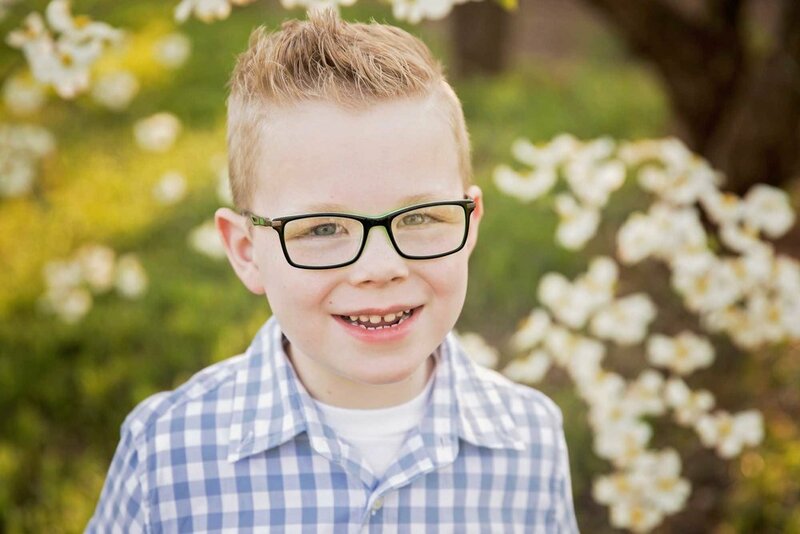 I love using being able to help my clients make memories, as well as provide beautiful family pictures, unlike anything they could get back home. The lovely Danielle and her family came in all the way from Florida to have her maternity session in the serene Smoky Mountains, down in Cades Cove. Since they were flying in just for the weekend for these pictures, I was super worried about the weather! Our original date ended up being rained out, but luckily, they were able to change up their plans to be here on a beautiful, sunny day. The weather in the Smokies can be so hit or miss, I always try to leave room for re-schedules for my out-of-town clients; there's nothing worse than missing out on your pictures because Mother Nature had other plans! Danielle borrowed a few gowns from my maternity closet, the Krysten and the Joselyn. She rocked both! I don't think there's a single gown in my closet she couldn't have pulled off. They complimented her sweet bump perfectly. Here's some of my favorite maternity pictures from her session. What to wear??? That's the question on everyone's mind when they book a Knoxville maternity session. Wardrobe can make a break your session, and while you're expecting, wardrobe can be even more of a challenge. I remember when I was pregnant, finding clothes I liked, that fit was a struggle, let alone maternity clothes that fit well enough for my maternity pictures. 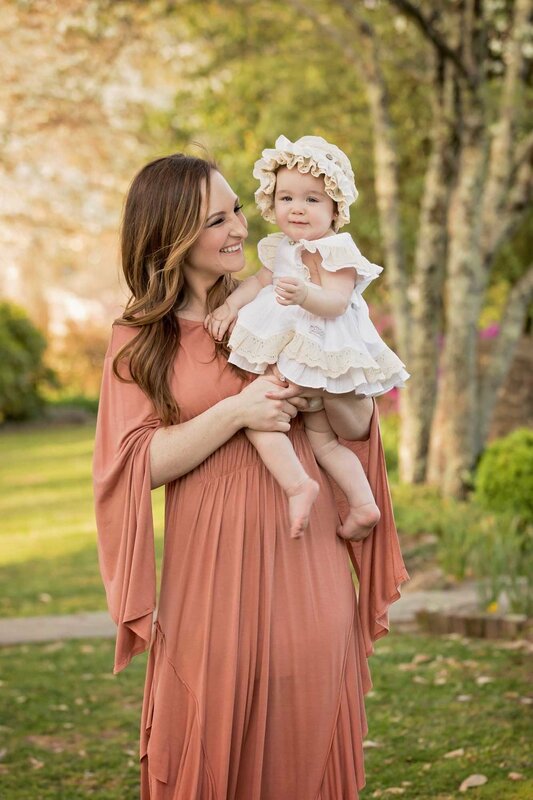 There's tons of beautiful maternity gown designers, like Sew Trendy, but they can get pricey for just one wear, especially if you want a few different styles. I saw this dilemma firsthand and watched a lot my maternity clients struggle to feel amazing in their outfits, so I did something; I created my client closet. I currently have over 50 maternity gowns in a range of sizes and styles for you to rent, at no cost, for your maternity session. I've curated these to have amazing options that photograph beautifully. I'm so excited to be able to offer these gowns to make your maternity experience that much better. What Mama doesn't want to feel like a princess for at least a day? Some of my favorite maternity gown images! Check out the entire gown collection. 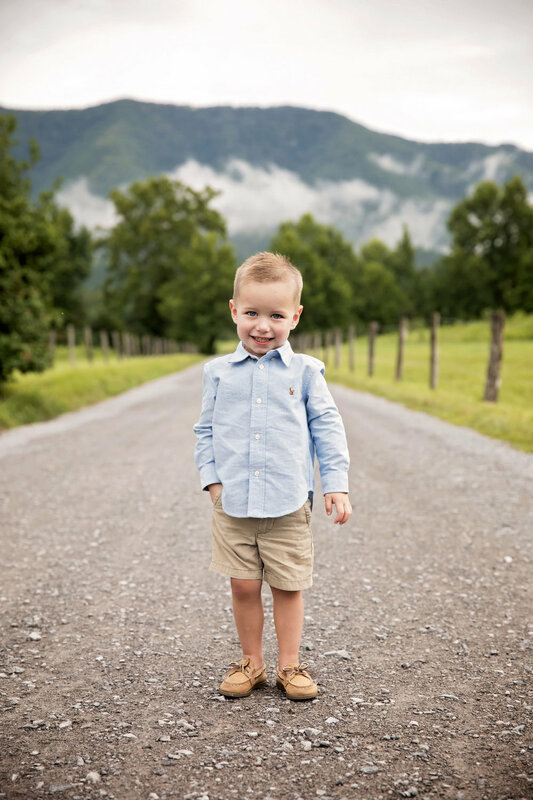 Gatlinburg family vacation sessions are awesome! 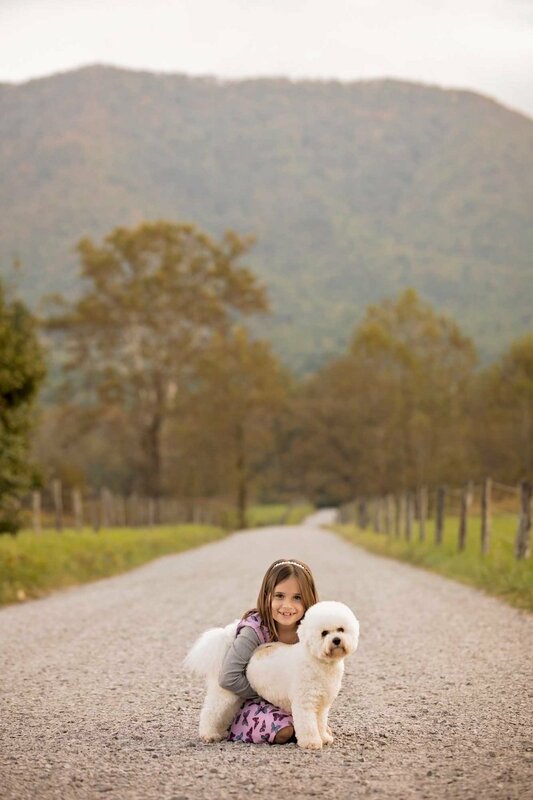 I love providing these families with beautiful family pictures in our amazing Smoky Mountains. The Kirkwoods were no exception. We had a bit of a rough start; Cades Cove can be super confusing with it's one way loop and random traffic jams ( bear sighting!) and these sweet people accidentally entered the loop without me, and spent almost an hour trying to get back to meet me. Despite our late start, we were able to create some beautiful family pictures together with spectacular mountain views. This family is just so photogenic, picking highlights was hard! Joanna and her gang brought along their sweet pup, a pretty little Bichon Frise. He, of course got a few pictures of his very own. Pet photography can be tough, but this little guy was a natural poser. It's that time of year again! Dedicated UTK seniors are preparing to graduate and start the rest of their lives! College senior pictures or graduation pictures are just a great way to celebrate your grads accomplishments and see to see how far they've come. 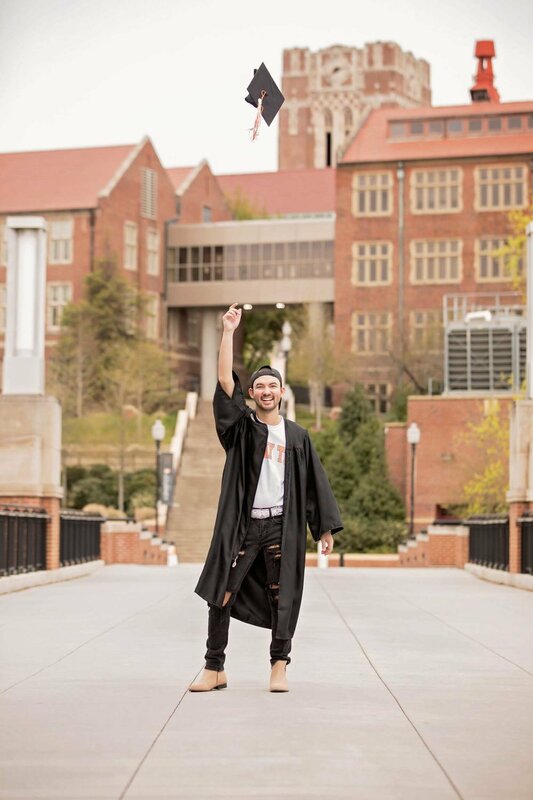 Blake finished at the University of Tennessee in just three years : I must say, I was impressed by his dedication. Of course after living on campus for three years, it's great to grab some pictures at your favorite hang outs, and iconic spots on campus. The weather was beautiful and cool, a perfect Spring day to walk around the UTK campus. We just had to snag a few family photos to celebrate the big moment, and sneak one of Blake and his lovely Mom. Where would we be without our biggest supporters: Mom and Dad? 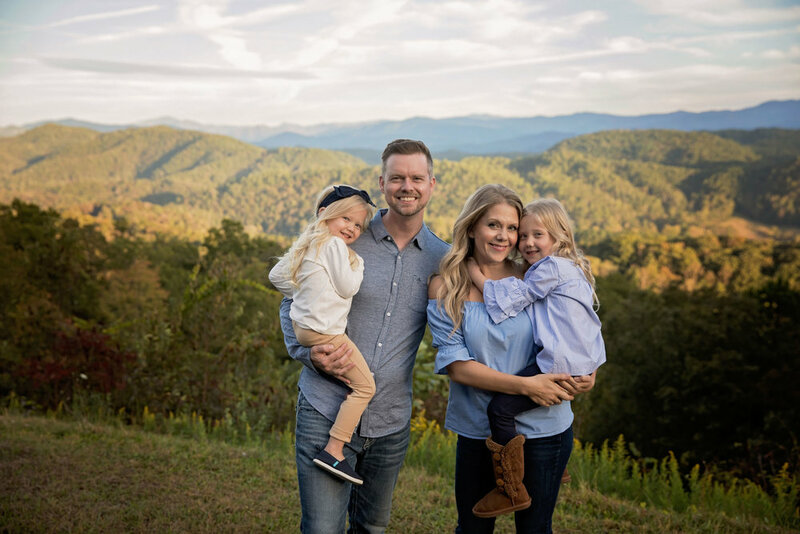 The McFadden Family brought their whole, fun big bunch to Gatlinburg TN and the Smoky Mountains for an extended family vacation and contacted me for a session while they were all able to be in once place together. I must say, these beautiful people were all a pleasure to work with, but the grandparents really stole the show. A few months back, they celebrated 60 years of marriage. I must say, it was a joy to chat with them. They had so many stories of their time traveling with the military, and adventures in their marriage. They are truly a couple to aspire to be like. After 60 years, they were still so in love, and laughing together. The family had a bit of a surprise and took off back to the cars, giving me a wonderful opportunity to take beautiful couple portraits of the happy couple with an amazing Smoky Mountain backdrop. Two birds, one stone; an amazing Gatlinburg vacation and 60th anniversary photos! When their family returned, everyone had changed into purple shirts, unknown to the grandparents. You see, their Grandpa has alzheimer's and purple is the alzheimer's support and awareness color. This amazing family had come up with the fabulous show of support. Let me tell you, there weren't many dry eyes left after that surprise. As a photographer, I that definitely makes my top 5 list of favorite moments, right up there with military homecomings. That's what family is all about <3. 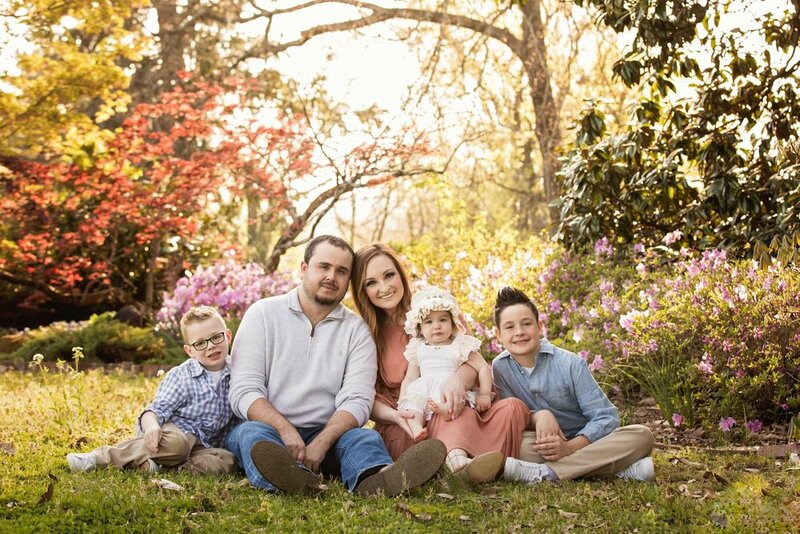 Say Hello to Heather's beautiful bunch; an adorable family of five! Heather came to me, after tons of Spring blooms for her family session. The Dogwood winter caused us to reschedule and had us a bit worried about flowers, with the weather dipping back down to freezing here in Knoxville. Thankfully, Mother Nature rebounded beautifully, and the Knoxville Botanical Gardens were FULL of all kinds of flowers. Meet the lovely Samantha; a beautiful Mama to three, and expecting another beautiful baby this summer. She is in that perfect window for Knoxville maternity pictures, in that 28-34 week range. I love that time frame because you have a perfect bump and look absolutely stunning, but you're not so big you're uncomfortable, or risking having an early baby and missing maternity pictures. I stumbled upon these beautiful, rustic stone steps several weeks back, and I couldn't love them more. They make a perfect backdrop, and I was so excited to use them for Samantha's session. They are just so grand and photogenic. In these first images, she is wearing my Hera gown, by Sew Trendy. It's available to rent for your own maternity session, asbolsutely free. 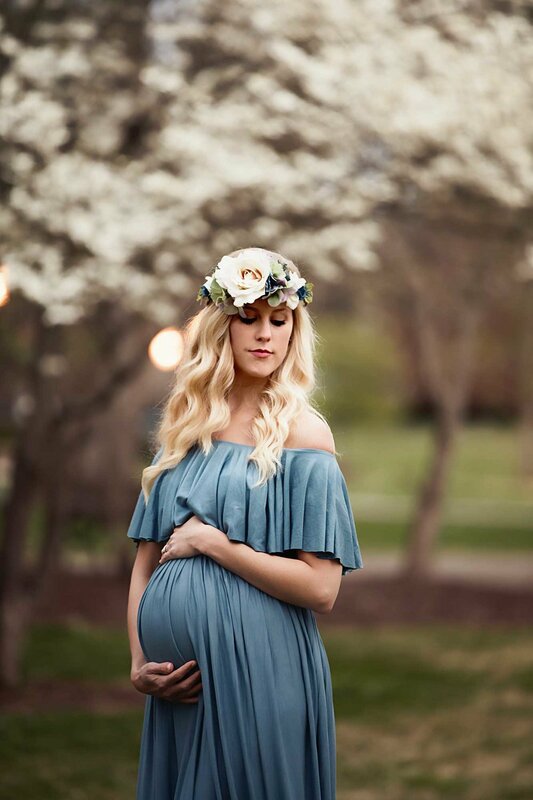 The second half of Samantha's maternity session took place in all of the wonderful spring blooms we currently have; Dogwood trees, and Redbud trees were everywhere! It was perfection! To stand out among all of the flowers, Samantha wore the Corbyn gown to really contrast. Meet Julie's beautiful extended family! This amazing extended family came to the Smoky Mountains for a Pigeon Forge family reunion in a relaxing cabin for their Mom's 60th! I love watching these families celebrate milestones together, and just enjoying each other's company. Smoky Mountain vacations bring everyone together <3. We absolutely lucked out on the day of their session! Not only did we have rustic cabin steps for pictures, right across the street, there happened to be an amazing Gatlinburg mountain view. The weather was perfect and the sun dipped behind the clouds just long enough to grab some family pictures with the awesome view. During family reunion sessions, I love to grab all kinds of different groupings, parents, siblings, individual families, and some candids, just all those fun pictures for you to look back on after your vacation.